Apparently, I have embarked on a Thoreauvian experiment with my tiny house. Like I previously mentioned in an earlier blog post, I moved out of a mansion sitting in an upscale community and into a tiny house having a square footage of approximately 614. After having donated near 10 truckloads of what I considered to be junk, freeing myself of the weight of such materialism, I went to the woods for a month and lived in a camper in between houses. I have always been intrigued by the notion of a small dwelling place. As a child, no matter the location or season, I found a way to have a small club house for important child gatherings. I built a cabin on some property I owned some 8 years ago out of cherry and black walnut wood. That project got away from me and was eventually abandoned, then taken by a tornado. The foundation was left and built upon. It makes a nice home for someone now. As a thrift store connoisseur, I find used books to not only be well worth their value, but also plentiful. I occasionally prowl through and pick up dozens of good used books in order to soak in their wisdom when I get ready. 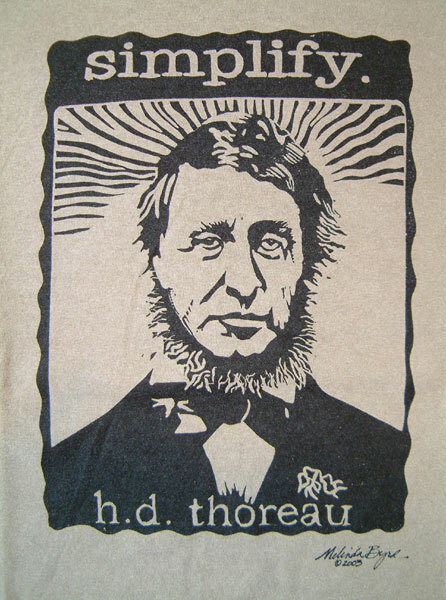 One of the books being Thoreau’s “Walden.” I began reading it a few days ago and also found myself on a journey of kinship with the famed writer. He speaks of society and nature, the music he hears in the woods by Walden pond, much like the music I hear day and night now. I bask in the sounds of the creek rushing, the owls hooting their nightly conversation, the crickets, frogs, and birds. A written word is the choicest of relics. It is something at once more intimate with us and more universal than any other work of art. It is the work of art nearest to life itself. It may be translated into every language, and not only be read but actually breathed from all human lips; – not be represented on canvas or in marble only, but be carved out of the breath of life itself. That is the most beautiful quote about books I have read thus far. I will also add that when I started this tiny house experiment, I felt it necessary to cut down on superfluity. So far, it has proven beneficial. Living simply seems to suit me at this time in my life. I would love to share some pictures of my tiny house, but I am afraid it would not do justice yet, as the bead board isn’t all hung and my tile work isn’t finished. As for how long I will remain a part of this tiny house movement, I can not say. I don’t like predictions, really. When it is time to move on, I trust that I will know it. p.s. If anyone wants to get me this t-shirt, I’ll consider it a necessity and will totally wear it.